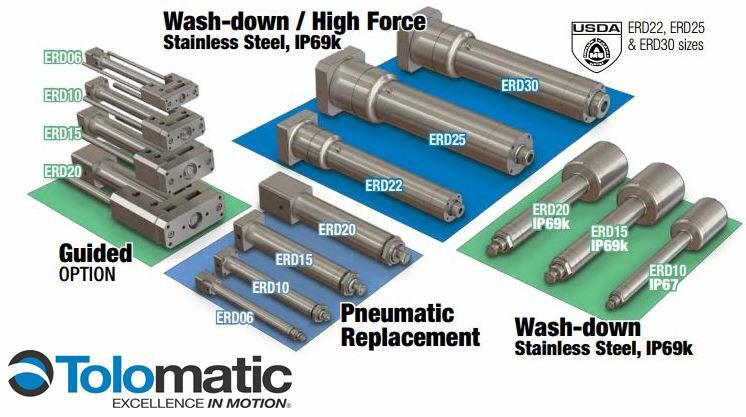 ERDs, Electric Rod-Style Actuators, from Tolomatic are considered an alternative to pneumatic cylinders and an option for automating manual processes. They're compatible with many NEMA & metric mount stepper and servo motors to provide a flexible electric actuator solution. Available with all stainless steel and IP69k options, the ERD is an ideal hygienic actuator for the food & beverage processing environment. The all 300 series stainless-steel ERD for 10,15, & 20 sizes incorporates hygienic design principles and includes a protective enclosure for Tolomatic stepper/servo motors. CLICK HERE to visit Tolomatic's website with more information!